Hiring managers for nursing positions want to know that candidates can cope with the stresses of the job and fit in with the team, as well as performing the basic functions of the role. There are all kinds of nursing jobs out there, in every kind of environment imaginable. 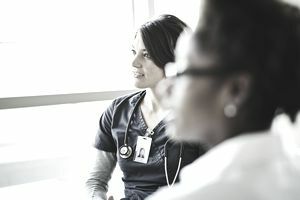 The qualifications needed for an ER nurse in a busy city hospital are very different from those of a community nurse at a residential treatment program. Your interviewer will try to determine whether you’re a good fit for this job in particular. That means figuring out how you deal with specific job pressures as well as the challenges that come with every nursing position. To impress the hiring manager, prepare answers to standard nursing interview questions as well as questions about your training and qualifications. It’s also a good idea to have some questions to ask your prospective employer. While your resume and cover letter will detail your training and certifications, it pays to be prepared to answer questions about your education and skills. Come to the interview with a few answers to the job interview question, "How has your training prepared you for the challenges you will face in this position?" I had an internship position at an oncology center after graduating last May, which gave me hands-on experience with patients, and I am anxious to pursue my career specializing in cancer treatment. My clinical training in the emergency room of City Hospital prepared me for the fast-paced care required of an ER Nurse. I had the opportunity to work as a research assistant for Dr. Zane, who was writing about new findings in the treatment of heart disease when I was working at City Hospital. The knowledge I gained during that time prepared me for assisting with cardiac patients in a more effective way. How will you deal with difficult patients and/or their families? How How do you deal with a patient who isn’t following care instructions? How do you handle patients who complain constantly about pain? What type of nursing experience do you have? Why did you choose (ER, OR, ICU, LTC, FNP, or other specialty areas of nursing)? What kind of precepting/teaching experience do you have? In what way are you a leader at your current organization? Most hiring managers will close out an interview by asking if you have any questions for them. Your reply should never be, “No.” Prepare a few nursing interview questions to ask your potential employer. Remember: you’re interviewing them as much as they’re interviewing you. Your goal is to learn as much as possible about how the unit functions and what your workday will be like, should you get the job. Is there support staff on the unit to assist nurses? In what ways are nurses held accountable for high qualities of practice? How much input do nurses have regarding systems, equipment, and the care environment? What professional development opportunities are available to nurses?